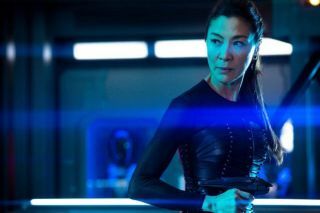 "Star Trek: Discovery's" Philippa Georgiou (played by actor Michelle Yeoh) is getting her own TV spin-off. According to Deadline, Yeoh will reportedly continue on Discovery while this new show is developed simultaneously. The new show is being developed by Yeon Kim and Erika Lippoldt. "Michelle has shattered ceilings, broken boundaries, and astonished us with her grace and gravitas for decades," said Star Trek: Discovery executive producer Alex Kurtzman. "As a human, I adore her. As an actor, I revere her. Erika and Boey are remarkable, exciting writers who bring a fresh perspective to the world of Star Trek, and we're all thrilled to explore the next wild chapter in the life of Captain Philippa Georgiou." This would be the third live-action "Star Trek" show in development, joining Discovery and the Picard series. No title or release date for the Yeoh-led "Star Trek" spin-off has been announced.